The following most recent update must be downloaded before you can access any of the online features or downloadable content for Monster Hunter: World. In addition to the new monster Behemoth, this update also features other improvements to gameplay. The following changes were applied at the same as update Ver. 4.00/4.0.0.0. We apologize for the late notice. With the addition of Lunastra and Teostra in update Ver. 4.00/4.0.0.0, they have now also been added to the pool of Threat Level 3 investigations. The draw chance for certain tempered elder dragon investigations have been revised. All Threat Level 3 investigations now have an equal chance of having increased special reward slots. Originally, varying values were used to determine the number of special reward slots for each tempered elder dragon investigation, but these have all been matched to the value for Vaal Hazak, which was the highest. - You may see increased special reward slots for Threat Level 3 investigations that you possessed before this fix was applied in Ver. 4.00/4.0.0.0. - The chance for increased special reward slots for tempered Vaal Hazak has not changed. The naming method for investigations in other languages has been changed to match the Japanese. Investigation names now include the main target in addition to the quest type (hunt, capture, or slay). Affected languages include: Arabic, Brazilian Portuguese, English, French, German, Italian, Polish, Russian, and Spanish. Great Hunting Investigation ⇒ Hunt: Great Jagras, etc. Mistakes were corrected in the Asian version text for Traditional Chinese and Russian customer support information. This update also includes other minor bug fixes. In addition to the new monster Lunastra, this update also features other improvements to gameplay. The "Support" menu option was added to the title screen menu. Fixed a bug where the Kulve Taroth Siege quest line would not progress correctly under certain conditions (specifically: if you speak to the Admiral out in the field when participating in another player's instance of the "A Wound and a Thirst" or similar quests, after having collected Kulve Taroth traces but BEFORE having spoken to him separately in Astera). Players who have encountered this bug already can return to Astera and speak with the Admiral, triggering the council scene, after which the Kulve Taroth Siege will become available. Fixed a bug where the great sword Wyvern Ignition "Impact" saw its fire elemental attack value unintentionally reduced to 240. The value has been reset to 510. Fixed some bugs in the data collection for the statistical summaries given to you by speaking to the First Wyverian (weapon usage, number of monsters slain, etc.). Data will be progressively reset starting on April 26. For the duration, the First Wyverian will not give out any statistical information, but this should not affect gameplay in any other way. Please note that the statistical data may be low in accuracy for a short time after the process has finished. The update will also include various minor bug fixes. This update features the introduction of new monster Kulve Taroth, as well as other improvements to gameplay. With this update, we have fixed a bug related to the bow used in the Monster Hunter Championship 2018, as well as a change to the functionality of the item pouch. To the players who are planning on participating in the Monster Hunter Championship 2018, we deeply apologize for changing the design of the gameplay before the tournament begins. In Update Ver. 2.00, a balance update was done to the bow’s Dragon Piercer attack to fix a bug where you could shoot past the attack's angle limitations. However due to this update, when the target is lined up with the reticle at a very fast speed and the Dragon Piercer fires, it was discovered that the player may not be able to face in the direction of the reticle. This has been fixed so that even if the player is aiming at a target quickly in a direction they are not facing, the reticle will still be able to aim in that direction. Please note that during Dragon Piercer, if the reticle is aimed at an area outside of the allowed range, the attack will fire in the direction the player is facing. When selecting loadouts during Arena Quests, a bug occurred where the item window order would change. However, this has now been retooled as part of the game design. 1.From the default cursor position, the item pouch order when checking equipment info will be from left to right. 2.Next, the fixed items will appear in the following order, left to right: Whetstone, Capture Net, Fishing Rod, and BBQ Spit. 3.The last items will be the specialized tools, listed from left to right. This update features the introduction of new monster Deviljho, as well as other improvements to gameplay. Xbox One: See system for details. Fixed an issue that occurred when players had 31 or more Slashberries in their item pouch at the time of the last update (PS4: Update 1.05 / Xbox One: Update 1.0.0.10) where the maximum number of Slashberries a player can hold in their item pouch was reduced from 60 to 30. This update will move any Slashberries exceeding 30 in your item pouch to your item box. Made additional fixes to an issue fixed in the last update (PS4: Update 1.05 / Xbox One: Update 1.0.0.10) where, rarely, uninvited non-squad members could join a Squad Online Session, or Squad members could not join one of their own. Readjusted the search algorithm when searching for another player's session to join. Fixed an issue where the error message "Failed to retrieve squad information. Please wait and try again." would appear and squad features would not be usable. However, as a result of this fix, players who were affected by this bug will have all of their squad data reset. Additionally, players in squads whose squad leaders have their data reset will also see any affiliated data disappear the next time they log in. We apologize sincerely for the inconvenience, and ask that you reform squads or reinvite players whose data are lost. Fixed an issue where, rarely, uninvited non-squad members could join a Squad Online Session, or squad members could not join one of their own. Squad Online Sessions can still be joined by players outside of the squad via friend invite or Online Session ID search. Fixed an issue where some players could not claim the item pack "5 Million Celebration Item Pack". The availability for this item pack has been extended to February 22, 23:59 (UTC). Fixed an issue where, under certain conditions, decorations would be lost. Fixed an issue that occurred when selecting items with the "Sell Items" option (from the item box inside base camp tents) by hiding the decorations tab. General changes were made to bowgun ammo. Increased the power of Normal Ammo (1, 2, 3), Pierce Ammo (1, 2, 3), and all elemental ammo (except Dragon Ammo). Decreased the power of Slicing Ammo, and reduced the effect it has when hitting other players. Reduced the maximum number of Slashberries you can hold in your item pouch from 60 to 30. Players can still use any remaining extra Slashberries if they currently have more than 30 in their item pouch. Readjusted the Elderseal calculation for dragon pods. Fixed an issue where information on endemic life would disappear from the Wildlife Map when moving about the field. Fixed an issue where the assignment "Flying Sparks: Tobi-Kadachi" would not appear on the quest board after departing on a different quest in the middle of speaking with the Chief Botanist just before the quest is first assigned. Fixed a rare bug that would cause players to lose control of their characters when completing a quest with certain start menu sub-menus open. Fixed an issue where, in rare cases, the assignment "The Encroaching Anjanath" would not appear on the quest board during online play. Made some readjustments to how Elderseal values are calculated. Fixed an issue where you could sometimes obtain an inappropriate amount of research points or items when completing bounties. Fixed two issues concerning hunting horn actions. 1. Fixed an issue where you sometimes couldn't perform a dodge cancel before the melody effects are applied during an Encore. 2. Fixed an issue where a Performance would sometimes not trigger a shockwave attack. This update addresses bugs and issues that have been discovered since the start of the third beta test. PS4: Includes the contents of the previously announced update 1.01. Xbox One: Includes the contents of the previously announced update 1.0.0.6. Adjustments were made to address the issue of excessive hits registering when using certain weapons in combination with items and abilities like torch pods, Wyvernblast, large barrel bombs, Health Boosters, and shock traps. This update must be applied before you can access any of the game's online features. The gallery allows you to view all of the cutscenes you have watched so far in the game. The player character that appears in the cutscenes will vary depending on which save data you have loaded. 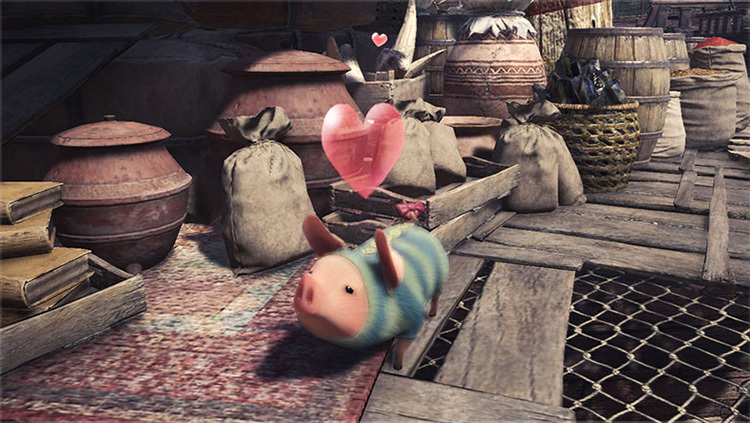 Once you have made enough progress in the story, a Poogie will appear in the tradeyard in Astera. Get the Poogie to warm up to you by petting it in just the right way! Once it's friendly with you, pick it up and carry it to different places throughout Astera... and you might just be rewarded for your kindness! In addition to Japanese, English, French, Italian, German, and Spanish, the following languages will be added. Additional voices will not be added. Additional display languages vary by region.